Top quality players you can get for a relatively cheap price in FM13. Welcome to Bargain Watch, best bang for your buck! 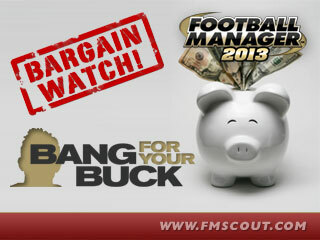 Welcome to the best list of top bargains in Football Manager 2013 by FMScout.com. This is by far the most in-depth and well-presented list of cheap quality players in Football Manager 2013. I'll be updating this list often to reflect all official data updates. This is the first edition, including over 250 players! For this list I filtered players with initial value of less than 2.5M and initial wage of less than 25K. There are no free agents here, but you can find players who also appear on my FM13 wonderkids list. At the moment the default order of players in the list is by recommendation, meaning that players on top of each position table are more recommended than the ones lower down. When I'll be more calm and have some spare time, I'll try to add recommendation stars for you. 14 comments have been posted so far. Mattheus, Brazilian AM(RC). Has a great potential for Premier League clubs, as well as a release clause of only 925k. will any of these sign for the blue square premier? What about Wellington Nem, 19 years old (AMC/RL/ST) ? His release clause is at £3,500,000 and his wage is at £750 per week. I think Dzagoev, the russian AMC, is a bargain, don't u?! Someone needs to make a shortlist of these. Handcrafted in Symi, Hellas. Page created in 0.405 seconds.